I just finished reading paratriathlete Sarah Reinertsen's book, In a Single Bound. It was an awesome page-turning read of an amazing and ongoing journey of pushing one's physical and mental limits. She's a multi-time Ironman (first female IM finisher on prosthetic leg), marathoner, record-setting track runner, and participant on CBS's 'The Amazing Race'. She tells her story with tremendous honesty and I was left thinking, this is a person I would really like to meet! And next week I get to meet her! I have been paired with Sarah for the ITU Paratriathlon World Championships. I'll be her assistant in the transition area, called a "handler", and will have responsibility for helping her to have smooth and fast transitions. I'm really looking forward this opportunity. Sarah stepped onto the world stage after making sports history in one of the toughest endurance events in the world — the Hawaii Ironman. This legendary race starts with a 2.4-mile swim (3.8km), continues with a 112-mile bike (180km), and culminates with a 26.2-mile run (42.2km), all in a single day. 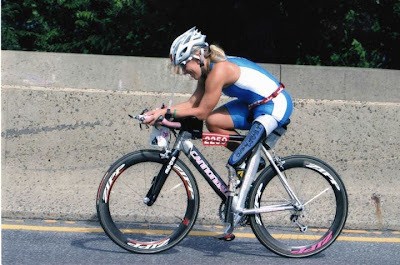 On 10/15/05, Sarah completed the Ironman World Championships in Kona in a very respectable time of 15 hours and 5 minutes, becoming the first woman to finish an Ironman on a prosthetic leg. A year later, she raced around the world on “The Amazing Race,” the Emmy-award-winning CBS reality TV series. Sarah’s story has been covered in many national newspapers and she has graced the covers of many magazines, including Runner’s World, ESPN, Triathlete, and Competitor. In 2009, GPP Life published her book, “In A Single Bound,” an honest, touching and funny memoir about how a feisty, one-legged girl struggling to fit in with her two-legged friends grows up to become a world-class athlete and TV personality. Sarah Reinertsen continues to race in triathlons and road races around the world and is a current member of the USAT National Paratriathlon team. 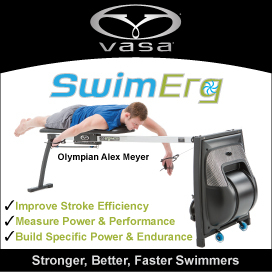 She is a 3-time world champion in ITU short course triathlon, and won the Ironman 70.3 world championships in 2006. Prior to becoming a triathlete, Sarah had a prestigious career as a runner, both on the track and on the road. Sarah raced with the US Disabled Track Team for 10 years, including at the 1992 Paralympic Games in Barcelona. Several years later, she made the switch to road racing, competing in dozens of 10k’s and half-marathons, as well as 7 marathons, before becoming a triathlete. Along the way, Sarah has broken multiple world records, and won numerous awards, including the 2006 ESPN ESPY for best female athlete with a disability. Sarah spends much of her time giving back and serves as a spokesperson for both Össur, one of the world’s largest manufacturers of prosthetic equipment, and the Challenged Athletes Foundation (CAF), a non-profit that supports athletes with disabilities. Sarah mentors and inspires other athletes through a variety of Össur and CAF events, including hands-on sports workshops around the country that teach amputees how to run, spin, bike and swim. Sarah also works as a motivational speaker, and has moved many audiences at multi-national companies like Merck, MetLife, Credit-Suisse, Barclay’s, Accenture, etc. Through her multi-media presentation, Sarah shares her story and motivates others to realize their potential by setting goals, facing fears, overcoming set backs, living with hope, and daring to dream big. Sarah graduated from The George Washington University with a BA in Communication and International Affairs, and received her MA in Broadcast Journalism from the University of Southern California. Sarah lives and trains in Orange County, California. I'd highly recommend her book and suggest following her on her website and Facebook page! I'm so glad for the chance to be involved with paratriathlon in London. While I'm there I'll also get to see Coach John Murray who was central in my "Trication" experience in Florida with Multisport Performance Institute. He, along with Coach Mark Sortino and Connie Sol are head coaches for Team USA Paratriathlon.